Your fees are determined by the program you are studying, the number of courses you are enrolled in and your citizenship or residency status. Some students will be eligible for government HELP loans to defer their fees. A Commonwealth Supported Place (CSP) is a place at university which is subsidised by the Australian Government. A student studying in a CSP is called a Commonwealth Supported Student. A Commonwealth Supported Student could be an Australian citizen, a New Zealand citizen or the holder of a permanent resident/humanitarian visa. As a Commonwealth Supported Student, you are required to pay a contribution towards the cost of your education, known as the 'Student Contribution Amount'. Eligible students can defer this amount to a HECS-HELP loan. The majority of students enrolled in an undergraduate program are in a Commonwealth Supported Place. A Domestic Fee Paying student could be an Australian citizen, a New Zealand citizen or the holder of a permanent resident/humanitarian visa, who is enrolled in a program that does not offer Commonwealth Supported Places. Domestic Fee Paying students are not eligible to receive an Australian Government subsidy and are required to pay their tuition fees in full by the census date. Eligible Domestic Fee Paying students can apply to defer their tuition fees to a FEE-HELP loan. The majority of students enrolled in postgraduate programs are Domestic Fee Paying students. An international student is any student who does not identify as an Australian citizen, a New Zealand citizen or the holder of a permanent resident/humanitarian visa. 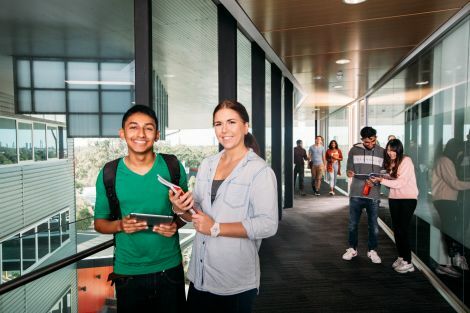 International students are not eligible for an Australian Government fee subsidy and are required to pay their tuition fees in full by the census date. International students may be eligible for student loan programs or scholarships offered by their home country. Visit financial aid and sponsored students to find out more. Fees are payable on all courses you are enrolled in on the census date each trimester or study period. Once you are enrolled, your fees balance and first due date will display on your myGriffith Fees page. You will be notified via your Griffith student email account when your Academic Charges Account is available. This will occur at least one week prior to the start of each trimester/teaching period. If you change the courses you are enrolled in, you will need to generate a new Academic Charges Account to view your revised fees. Once you have paid your fees, you will no longer be able to generate an Academic Charges Account for the trimester. Instead, you will be able to generate a Financial Summary. The census date is the payment due date for a course. Your fees are due for payment by the census date for each of your courses. The standard census date for Trimester 1, 2 and 3 is the end of teaching week 4. However, if you are studying a course in intensive mode, via Open Universities Australia or if you are studying certain programs, your course may have a different census date and therefore a different payment due date. If you are eligible for a government HELP loan, you need to apply for the loan(s) and submit your Tax File Number to the university, by the census date. Your loan will be repaid via the Australia taxation system once your income reaches a certain level. If you are not eligible or do not wish to apply for a HELP loan, your fees need to be paid in full by the census date. The census date is also the last date you can drop a course so you are not liable for the fees. There are three ways which you can pay your fees for Griffith University. To ensure you don't miss payment due dates, when choosing a payment method please be mindful of the length of time it will take for the money to transfer from your bank account. Payment and transfer of funds is immediate. Credit card payments can be made via the Western Union GlobalPay for Students website. Telegraphic Transfers can be made by transferring funds to Western Union Business Solutions at your bank or through online banking. International students can make payment in their local currency where possible. Payment and transfer of funds can take between four to seven days. Payment and transfer of funds can take between two to four days. If you are approved for a Government HELP loan by your census date, your loan will be repaid via the Australia taxation system once your income reaches a certain level. Penalties for non-payment may apply if you do not make full payment of your fees by the census date. If you drop a course on or before the census date, you will not be liable for the course fees or the student services and amenities fee. If you have made a payment towards your fees, you will be eligible to receive a refund. If you drop a course after the census date, you will be liable for the course fees and the student services and amenities fee. You will not be eligible to receive a refund unless Special Circumstances apply. The Australian Commonwealth Government offers a number of loans under the Higher Education Loan Program (HELP) scheme. These loans are very different from those available from commercial lenders as you do not require a deposit, employment history, assets, income or guarantor. Students that meet the citizenship and residency requirements for these loans will be prompted to complete an electronic Commonwealth Assistance Form during the Pre-enrolment questionnaire, prior to enrolling in courses. An Academic Payment Plan (APP) allows an eligible student to pay their tuition fees, in equal monthly instalments, over a period of time. To be considered for an APP, you must be able to demonstrate genuine financial hardship. If, after commencing study in your program, you obtain permanent resident status in Australia, you will be allocated a non-international fee-paying place. To be eligible, you will need to provide the University with evidence of your new status prior to the census date for the Trimester you are enrolled. You will then be able to apply for a Commonwealth supported place in the next admission period, provided that you satisfy the relevant conditions. Trimester 1 and 2 are compulsory trimesters. To qualify for student income support, you will need to maintain a full time study load in a compulsory trimester. If you commence in Trimester 3, you will qualify for income support from the onset of your program if you are enrolled full-time in your initial trimester. For most programs, the minimum full-time study load is 30 credit points. This may vary if you are undertaking a program with a non-standard full-time study load. In addition to government study loans, Griffith offers considerable support to students, to help them manage their finances and pay their fees on time. Domestic candidates who are admitted to a Higher Degree Research (HDR) program are exempt from tuition fees. Candidates will be provided a Commonwealth Government Research Training Program (RTP) Fee Offset supplemented by tuition fee support from Griffith University. HDR candidates will still need to consider additional study costs such as personal student materials, technology and some support services. Further information regarding Higher Degree Research at Griffith can be found at Research study.